Following are common foundation repair questions we hear from both home and business owners. Please follow the link for complete answers to these common questions. Question: What do you mean by foundation repair? Answer: Foundation repair is a method of underpinning and stabilizing the concrete, block, or brick support walls that support a structure. For a complete list of foundation repair definitions, see: Foundation Repair Definitions. Question: What types of foundations are there? Answer: There are three basic types of foundations: basement, crawl space, and slab-on-grade. Each type requires a different approach to repair? See more: Types of Foundations. Question: What are the types of foundation problems? Answer: Most foundation problems are due to soil-related issues, including poor compaction, expansive soil, weak soil, and poor waterproofing. Each cause different problems requiring different solutions. See more: Understanding Foundation Problems. Question: Why do I need to do foundation repair? Answer: The primary reason you may need to do foundation repair is that the causes of foundation problems, usually poor soil condition and improper drainage, will continue to cause further damage to your foundation until you may be forced to replace it entirely. See more: Reasons to Repair Your Foundation. Question: How long can I wait before doing foundation repair? Answer: If you have signs of potential foundation failure, such as bowing or leaning walls, floor and ceiling cracks, or sloping floors, it if better to repair the foundation as soon as possible because replacing a foundation is significantly more expensive than repairing one. See more: Don’t Wait for Foundation Repairs. 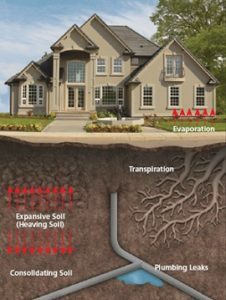 Question: How does the soil affect my foundation? Answer: Many homes in the Kansas City area have a clay soil which expands and contracts and causes damage to foundations. For solutions see: Soil Conditions and Foundation Repairs. At Pro Foundation Technology, we believe the best customer is an informed one. If the information on this page does not answer all of your questions, you may find the answer in one of our blogs. If you have questions about the quality of our work, please read our customer testimonials. Otherwise, please do not hesitate to ask any of our professionals if you have a question about foundation repair or any of our other services. Contact us today!